Overlooking the Garden of the Gods National Park, the red rock formations provide such a scenic backdrop. With nothing but green as far as the eye can see, this setting brings tranquility to your wedding. The cliffs of Zion National Park provide a stunning backdrop. Accentuate the stone cliffs in the background with café lights. A lone cactus in the background reflects the Arizona desert setting. Pretty palm trees line the aisle at this luxe resort in a beautiful southeast location. A clearing in the woods next to a lake provides a magical wedding setting. Gauzy fabric blowing in the gentle sea breeze gives this beach elopement such a romantic feel. Swirls of petals reflect the ocean's waves. A pond dock in the middle of a forest is the perfect spot for an elopement. Exchange vows inside a circle of tropical flowers to reflect the gorgeous setting. Tropical flowers, driftwood, and sea grass perfectly reflect the natural surroundings. You can still enjoy the magic of the sand beneath your toes without it becoming a huge mess — lay down some beach mats along your aisle and underneath your guests' seats. A pier overlooking the bay provides a tranquil setting for a wedding. Embellished branches fit in perfectly with the beautiful natural scenery. Flower petals in tropical colors sprinkled down the aisle reflect this beautiful setting beneath a palm tree. With water this gorgeous, you don't need a ton of decorations to make your ceremony look spectacular! Surrounded by water on three sides, this grassy cape provides a dreamy spot for nature-lovers. Bring the indoors out with a single wall and a door to walk through for your grand entrance. An arch draped with greenery perfectly frames a sailboat in the background at this bayside wedding. Mountains in the background make this ceremony on the shore of Vancouver Island even more scenic. A single chandelier suspended from a rustic archway is all the decoration you need in this waterfront setting. Line your aisle with beachy greenery and tropical colored petals. 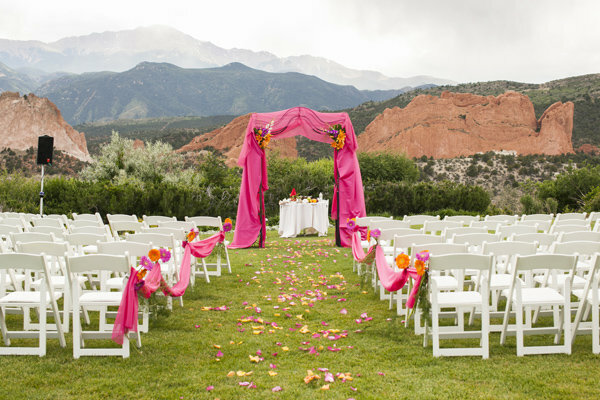 Pink petals and lush floral arrangements really pop against this gorgeous backdrop. Vintage doors add rustic charm to this lakefront wedding. Just because you're not getting married in a religious institution doesn't mean that you have to leave your beliefs behind. Decorate with meaningful symbols, like this cross. Keep it casual with a simple setup in front of the sand dunes. Reflect the colors of the falling leaves by lining your aisle with flowers in the same shades. A sturdy tree symbolizes the strength of your union. A small clearing in the middle of the forest is the perfect spot for a casual ceremony. These trees naturally create an arch for the couple to stand beneath. Lanterns suspended from trees add a personal touch to the beauty of the natural surroundings. Twinkling lights wrapped around this tree's thick branches create a mystical look during the day or at night. A weeping willow on the lake shore creates an ultra-romantic place to tie the knot. A clearing in the woods marks the perfect spot for an intimate wedding ceremony. A sweeping tree provides both shade and a gorgeous focal point during your ceremony. Keep your wedding ultra-private by choosing a spot tucked away in the forest. Add a delicate touch to the gorgeous natural surroundings with lush pink flowers. Old-World charm makes this garden setting even more enchanting. Situated between a pool and an ivy-covered building, this garden setting is pure romance. A break in the shrubbery provides the perfect place to make your grand entrance. You'll feel like you've wandered into a secret garden in this gorgeous location. An ivy-covered passageway makes a wonderful focal point in this garden. Rustic branches and bold flowers enhance the beautiful surroundings. Petals sprinkled around the natural scenery add a sweet touch. Lush greenery surrounds you in this romantic garden setting. This stately courtyard is surrounded by natural beauty. Toss some flower petals that reflect your wedding color palette into the water fountain. Towering floral arrangements and a luxe chuppah give an industrial ceremony spot a more romantic feel. A grotto provides a picturesque backdrop with rustic charm. Personalize your backdrop with sweet photos and mementos from your relationship. Dress up your aisle with floral arrangements draped in greenery and plenty of petals. Light up a nighttime outdoor ceremony with romantic candles. Perfectly designed for wedding ceremonies, this courtyard features a stone path down the aisle. Lily pads and lush trees bring this space to life. Exchanging vows in front of ivy-covered castle ruins will make you feel like a medieval princess. Take advantage of the beauty of an ivy-covered building as your backdrop. Lush flowers add warmth to a stone courtyard. Long, criss-crossing logs create a modern, architectural structure to stand under. This large stone structure creates a church-like backdrop outdoors. Brick and iron arches lining the aisle gives this space an old-world feel. A large pergola illuminated by café lights provides an intimate open-air ceremony setting. Add a whimsical touch with ribbon strands. A fabric-draped arch accented with flowers, beads, and a chandelier provides an eye-catching setting. A regal canopy makes this seaside location even more sensational. Personalize your ceremony structure by displaying your monogram or initial. Reflect the trees surrounding you with an arch made from branches. Dress up a plain arch with cheerful sunflowers. This church without walls provides a truly unique outdoor wedding ceremony experience. An archway made from a thick, curved tree branch adds a unique touch to this picturesque rustic setting. Give your rustic setup a glamorous touch with stands of pearls. Suspend paper cranes from your ceremony arch for good luck. Give your aisle a personal touch by displaying your favorite quote or Bible verse throughout. Autumn's falling leaves provide beautiful natural décor. These ultimate baseball fans tied the knot in a ballpark. The oversized porch to a palatial home makes a perfect wedding setting. Reflect the porch's columns with flower arrangements set on pedestals. Exchange vows on the porch with your guests seated in the yard below. A porch's bright lights put the couple in the spotlight during a ceremony at sundown. A cliff overlooking the ocean is the perfect spot to elope. A ceremony in the mountains is even more beautiful in autumn, when the leaves are changing colors. Guests will love taking in the view from a cliff overlooking the Pacific ocean. Outdoor weddings aren't just reserved for the warm-weather months! Bundle up with your guests and exchange vows overlooking snow-covered mountains. Create an intimate feel atop a mountain overlooking picturesque rolling hills by seating your guests in a semi-circle surrounding you. A man-made waterfall flowing from a cliff is such a dreamy spot to tie the knot. The contrast between the lush greenery on the golf course and the sprawling mountains in the background will wow your guests. Take in the mountain views as you celebrate your nuptials. A waterfall of crystal strands provides a glamorous backdrop. String a garland along the backs of your chairs to dress up a country club setting. Mark your aisle with wine crates, pretty petals, and vintage-inspired floral arrangements. Using a wine barrel as your altar perfectly reflects the vineyard behind you. Reflect your rustic setting with simple décor, including bales of hay. Use the barn as your backdrop. An outdoor chapel provides the perfect rustic setting on a farm. A "hitching post" provides a fun, rustic place to exchange vows on the farm. A patio behind a barn provides a gorgeous rustic setting. A stately home makes a wonderful backdrop. Dress up your ceremony seats with mix-and-match covers. Bountiful shrubs lining the aisle perfectly reflect the towering trees surrounding you. Give your outdoor wedding a homey feel with a throw rug beneath your feet.